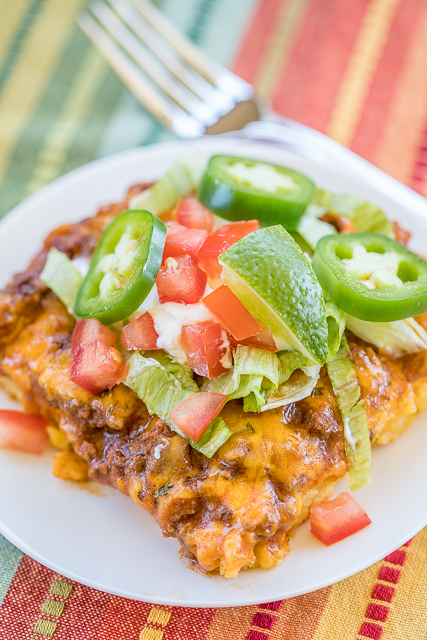 Beef Tamale Casserole - sweet cornbread crust topped with seasoned beef, enchilada sauce and cheese. A real crowd pleaser! Everyone always cleans their plate!! 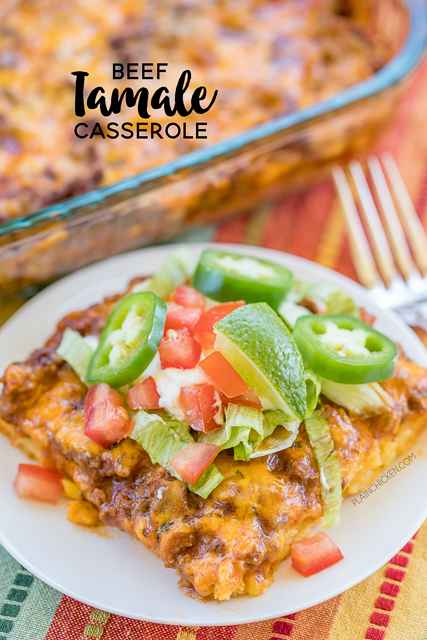 Such an easy Mexican casserole recipe!!! Stop what you are doing and get the ingredients together to make this Beef Tamale Casserole for dinner TONIGHT! It is crazy good!! 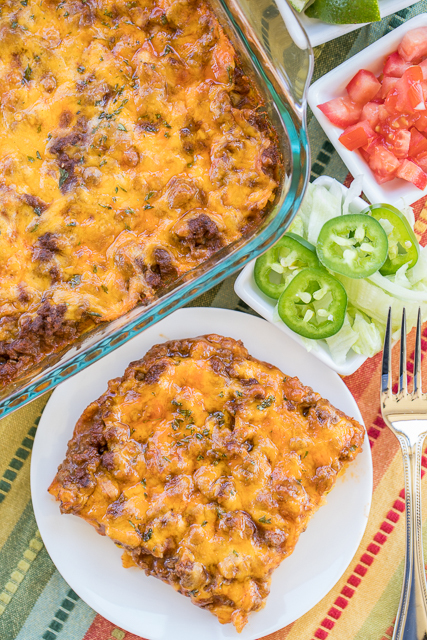 We could not stop eating this yummy Mexican casserole. Sweet cornbread topped with seasoned beef, enchilada sauce and cheese. I mean, what's not to love? Top the casserole with your favorite taco toppings. We used a little sour cream, lettuce, tomatoes, jalapeños and a squirt of lime. I'm getting hungry just writing about this dish! 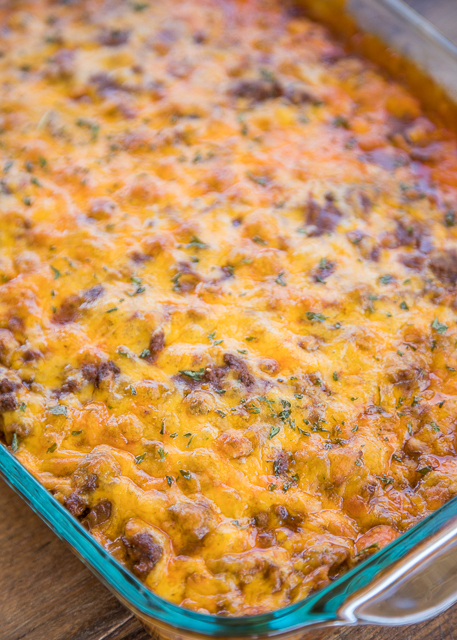 This Beef Tamale Casserole is super simple to make. It starts with a box of Jiffy Cornbread Mix. I love the hint of sweetness in the Jiffy Cornbread Mix! The casserole takes less than an hour from start to table. We served this with some black beans and Mexican rice for a quick and delicious weeknight meal. We had the leftovers for lunch and it was just as good! I love when I can get two meals out of one night of cooking! Give this a try ASAP! I promise that you won't be disappointed. Preheat oven to 400 degrees . Coat a 13 x 9 x 2-inch baking dish with nonstick cooking spray. Set aside. In a large bowl, combine muffin mix, corn, eggs, milk, and 1 cup of the cheese. Pour into prepared baking dish. Bake for 20 minutes. In a large skillet over medium heat, cook ground beef until no longer pink. Drain fat. Add taco seasoning packet and salsa. Cook for an additional 5 minutes. Toss beef in enchilada sauce. Pour beef mixture over cornbread and top with remaining cup of cheese. Bake for and 20 additional minutes. Allow to cool for 5 minutes and cut into 6 or 8 squares. Top with favorite taco toppings, if desired. My second favorite orange kitty! Y'all will love this recipe. It is GREAT!! I have made this several times (it was your chicken version but I would use ground beef) and it's a family favorite! I do use the bigger can of enchilada sauce because we like it wetter. And I use close to 2lbs of beef (or ground turkey). So good! I made this yesterday, and, between 2 of us, it's almost gone. This is really delicious, and, very easy. This gives me a new recipe to add to rotation! Thanks! I have a question about this recipe....Is the cornbread supposed to be cooked ALL the way? Am currently making it now (I think i may have used a slightly smaller dish!) and after 20 minutes its still a big jiggly in the middle! Just want to know for next time! Thanks! It will take longer in a smaller dish to cook. The cornbread should be fully cooked after the whole baking time. It won't be fully baked before you add the beef and cheese.